I truly enjoy earth day even though it might not be a holiday that stands out to all. It could be missed by many throughout their lives, but when you take the time it allows you to be grateful. This day gives you an excuse to take a pause and really think about what the earth has done for all of us. Everything we have comes from the earth. It fuels our bodies, our minds, and our lives in too many ways to count. Today I am taking time to process what the earth has done for me this year. I've experienced so many breathtaking parts of it. I'm lucky enough to see many stunning views as I travel throughout the year. From the twisting trails in Vermont to the high mountains surrounding Leadville. From dirt trails under my feet to the fresh snow under my skis. Since the last earth day, I've gained so many more glimpses of nature at its core. The kind of nature where I am a guest, lucky for even a short stay. The views it gave me stand out the most, but I also think about how the food that nourished me on my journey to these places was grown from the earth. The air I breathed on my trips, the water I drank, the ground I walked to get there, and so much more was all provided by the earth. ​ Soon thinking about my year spirals into thinking about the sheer magnitude of what the earth does for all of us. I feel guilty for not giving it the full appreciation it deserves for everything that it has given me. I think this is the beauty of earth day. When given even a moment of time for reflection on the world around you you're able to realize all the parts of your life influenced by it. It might even make you think that for all the earth gives you maybe you should give back a little. Over the course of nationals, I encountered the dragon. My very own personal dragon. It did not occur to me that I had a dragon, let alone developed a relationship with it over the season. Looking back, every practice was not to become stronger so I may slay the dragon but the way in which I was feeding, strengthening and taming the dragon. Occasionally through the season I could feel the dragon fighting back as runs turned into tiresome battles. By the end of the season I feel the early season work put into taming the dragon provided me with a reliable beast that would carry me through to the end of nationals. The dragons encountered on the course did not deserve to be slayed but instead could be tamed and learning experience and so I pushed harder in the individual sprints and chased down others in the team sprint classic. I feel that it is powerful and daring for someone to slay a dragon and lose the beauty, power and fire the creature possessed. But the one who can tame a dragon not only has the power within themselves to kill the dragon but possesses all the beauty, power and fire with in the dragon. When it comes to disease and cure, it is important that individuals do not see their own obstacles as things holding them back but as things they can overcome and gain a world of knowledge and experience to help others and prepare themselves for the next obstacle. To slay a dragon is to be powerful and lose everything that the beast possessed but to tame a dragon is to build a relationship with the beast in which it is willing to share its knowledge. ​I left my own front door for my traditional pre-race jog. I felt good. By that I mean running wasn’t a struggle and my brain wasn’t totally in a fog. I was excited to race and there was a spring in my step. Was I healthy? Would I race today? I mean, actually race? Despite what I might say, I hadn’t been healthy for weeks. Over the past months I struggled with various unidentified illnesses, Did I have mono? A cold and sinus infection? The label didn’t matter to me. I pushed through workouts I shouldn’t have done and spent hours curled up on my bed longing more than anything to feel the way I had before I got sick. At our coffee conversations, we talk a lot about restoration. What does it even mean to restore a landscape, an ecosystem, a body-mind? Can you bring something back to the way it was? When? How do you know what it was like? Is that even a good idea? These are the questions we discuss. As I ran, I thought back to myself. I tried to remember what it was like to get out of bed in the morning before my alarm, excited to run. I felt good, but did I feel 100%? Like the way I felt “before”? I couldn’t tell. At our coffee conversations, we also talk about the desire to restore or cure and what that implies about the thing being “cured”. If we say a landscape needs to be restored, that generally implies that there is something wrong about the way it is now. The same goes for the human body-mind. As a society, we often find ourselves feeling the need to cure any body-mind that is different from our own or from that perfect, non-existent “reference man”. We’ve talked in depth about how just because a body-mind is different, that doesn’t mean it is broken, that doesn’t mean it is less. My body-mind isn’t broken. I repeated to myself as I ran. I have to say this because the human body and mind are so interconnected. Skiing is a mental game as much as a physical one. It hurts. It hurts no matter what. Healthy or sick, it will hurt. I have to tell myself that everything is fine. The hurt is good, that I can do it, that I am not broken. Hours later I rage up campground hill, even as Anna Johnson passes by. It’s slightly demoralizing that she’s passed me here on every lap even if she is the defending classic sprint national champion. But I fight. My body screams out in protest, my legs burn, my chest hurts, my stomach churns, my back aches. I hurt. I want to throw up and collapse on the trail. But I don’t. I race. This is what racing is supposed to feel like, and that makes the pain feel good. It’s a type of pain I haven’t felt in a long time. I cross the finish line of my final lap, gasping for breath. My side feels like someone is jabbing me with a dull knife every time I breathe in, but I can’t help but smile. My body is not restored to a former version of itself. I may have won the 21k skate by minutes last year only to place 5th this year, but a year ago, this body would have been hard pressed to be top 8 in total individual time in that classic team sprint. This year I was 3rd, behind the top two classic sprinters in USCSA. Restored? No. But definitely not broken either. We work in rhythm. Two passes down the ski with a scraper, two passes with the brass brush and then continued passes with the nylon brush until the white powder is removed. When I finish with one brush, I pass it to Isaiah. When he finishes, he passes back to me. There is something unusually synchronous about our motions. I have been coaching for more than twenty years; rarely do I find someone with whom I can wax tech without becoming frustrated. I am a perfectionist; I have hyper-focus and I struggle when trying to talk and tech at the same time. Isaiah and I seem to have little need for words and yet we seem to be communicating. I wonder if he feels the same way? I wonder if he trusts me? The fact that I wonder is a deep sign of respect for him. We hit the snow. There are three pairs of skis. I take the skis labeled 5 and 6. Duncan is on 1 and 2 and Isaiah on 3 and 4. As we walk to the course, Isaiah just says, “Let’s take one full lap before we make any decisions.” I just nod my head. And we ski; we ski as the sun rises; we ski the men’s sprint loop. It is just slightly longer than the women’s sprint loop. How do I allow myself to be so madly, deeply and passionately in love with such a sexist sport? The course is wide, approximately 30 feet across. The corners are mostly swooping. After a flat that leads away from the stadium, there is a short downhill and then a quick up. The women’s course takes an early left and the men’s climbs a bit higher and then also takes a left. Arguably, this makes the men’s course easier. It affords a downhill rest after the climb. Both courses then take a right and climb for about 200 meters. I experience the first 30 meters of the hill as the most difficult on the course. They are too steep for me to double dance (what I call V2). A left turn allows the course to double back on itself and then the final downhill into the stadium has a fast but not highly technical righthand turn. At the bottom, there is ample time to sit in a tuck. To me, this section of the course, right after the turn and moments before I leave my tuck, is heaven. From the tuck position, one gazes directly into the sun rise. The huge TV screen is to the right and the stadium is to the left. The wind is cleansing and surprisingly clean. After one full lap, we silently switch skis; I put 5 on my right foot and 6 on my left. We take another lap. About half way up the long climb, I switch. Six now goes on my right foot. Christi always says that it is immediately after the switch that you can really feel the difference. I always close my eyes for the first four strides. I feel 6 accelerate a bit faster than 5. Down the fast downhill and into the sunrise; we switch pairs. I now take 1 and 2. We take another lap. Ski 2 accelerates faster and stays faster. A clear winner. Into the sunrise once again. Isaiah now speaks for the first time since we began testing. He asks for our choice; I note that 2 is a clear winner. I say that on the other pair, 6 would have been my choice (but it was less discernable). Duncan agrees. We switch full pairs. We take another lap. My body is fully warm now; I feel like I can better float on the snow. Part of the pleasure of skiing is the transience of each moment. I know that 30 minutes from now, this course will be a very different place. The number of people skiing will more than triple as athletes from across the globe begin to warm up. With each additional person who skis the snow; the snow will also change. We call this ‘transforming’ for the very simple reason that if the snow is natural, with repeated mechanical disruption, the intricate patterns of the flakes begin to flatten, morph and, eventually the sharp edges are lost. Even natural snowflakes can take on a great many different shapes. The most quintessential are the dendrites: radiating dendrites, stellar dendrites, ferne-like stellar dendrites. Dendrites have exquisite hexagonal symmetry. They mirror the perfection of the hexagonal packing of water molecules when they are perfectly frozen. And natural snow flakes can be hexagonal, triangle, needles, bullets, arrowheads, columns, rozettes, stars and even cups. Much the way that urban environments have geometric rather than fractal patterns, Manmade snow lacks the hexagonal snowflake shapes of natural snow. Despite this, it still morphs and changes as hundreds of skiers push it down and churn it up. The transience of the ski testing moments is what makes them both special and also so uncertain. We must make a decision about what top fluorocarbon to apply before the snow has fully transformed. After four full loops, we have narrowed our selection to ski 6 and 2. Isaiah asks me to take another full loop with this final pair so that they can get a girl’s perspective. I tell him that I will give him a woman’s perspective and I double dance out of the stadium. As I take the women’s course cutoff, I realize that I am the only female coach/technician on the trails right now. However, shortly after I cut right into the long uphill, I overtake a female skier. Her bib, unlike mine, is marked ‘Jury’. I realize that it is Sophia, the head of FISU (Universiade International Sports Federation). A consummate leader, I have seen Sophia repeatedly take charge in coach’s meetings where she is one of only four women in the room. She has a quiet and gentle way of convincing even the grouchiest coaches to behave in a sportsmanlike way. In fact, I will never forget the days when the Universiade was in Italy and the Ukrainian coaches repeatedly violated course closure rules. She simply calmly fined them 200 Euros per day and noted in the coaches meeting that youth skiing would be getting large donations that week! As I ski by Sophia, say good morning and express my thanks to her, I do not realize that the next day is National Women’s day in Russia. I also did not know that later than night I would come to find out that Sophia also goes home each night after a long day at the venue to try to catch up with her own work as a professor! I simply continue my loop, select 6 as the fastest ski, and know that if I am one of only two women on the ski trail this early morning, I am honored to share it with her! Today is the anniversary of the Poetry Out Loud Competition. A year ago, today, I was introduced to one of my all-time favorite poems. Maybe the themes of acceptable variation and beautiful imperfection make it feel relevant now. Maybe it’s just the concept of spring in Paris on a day with a low of 20 below. Regardless, I first heard “Monet Refuses the Operation” performed by Lauren Haiar, who is now a two-time state champion. The poem is beautiful, but in the context of the project I’m doing on cultural acceptability of blindness and Eli Clare’s novel, it is deeply appropriate. This poem is based on historical fact. Monet refused the operation to remove his cataracts. He produced some of his best-known pieces during this time. This is cure culture in poetry. Imagine the exasperation of Monsieur Monet’s doctor: No, Monet, the street lamps do not have haloes. You are old and the cataracts have affected your vision. We must remove them at once! Monet, fearing the operation, said: “I prefer to make the most of my poor sight, and even give up painting if necessary, but at least be able to see a little of these things that I love” (Gruener 254). Although Monet eventually did undergo the operation, and after much trial and error, return his vision to ‘normal,’ who is to say that his paintings from the pre-operative period aren’t just as captivating as those after? There are countless artists who have dealt with vision issues: Honoré Daumier and Mary Cassatt specifically were friends of Monet’s whose cataract operations had been unsuccessful (Gruener 254). After Monet’s vision was restored, he is said to have shredded canvases from before the operation and edited others. I wonder what we’re left with. How much of Monet’s way of seeing is lost because he felt it wasn’t worth sharing? My heart expands to wonder what a world without fixed notions of top and bottom, seeing and not seeing, disability and ability, would look like. general practice : the journal of the Royal College of General Practitioners vol. 65,634 (2015): 254-5. Jean Piaget described the development of a learner as a cycle in which, through a series of actions and effects of those actions on objects, learners come to recognize complex patterns. One might describe Piaget’s cycle as being a spiral, for as the learner comes to recognize more and more complex patterns, she is also able to achieve more complex actions. My fingers trace spirals around his scapula and at the center of the spiral is the pressure point that relieves the trapezius and terus muscles. Perhaps part of the calm that I feel when massaging athletes derives of the familiar patterns. Scraping, releasing, passing three times in line with the muscle fiber. I recognize patterns that I can feel but not see. Yesterday and today mark the first full race of the Games. The race unfolded over two days because it was pursuit style. Today the racers began where they left off yesterday only in the skate rather than the classic technique. Throughout these two days, I have been thinking deeply about patterns. In yesterday’s classic race, Nate had the race of his life; Trevor, Anna, Ana and Rya skied well. By contrast, Mason, Becky, Kevin and Mitch had tough days. What was the pattern? Did the skiers who skied well all do a morning run before breakfast? Did I have a chance to give all the high performers a massage? Was it the wax? The answer to the latter question seemed easier to systematically address so I started there. Isaiah, our head wax technician, had applied the same kick and glide to all athlete’s skis and all had a chance to test before the race. Mitch, Trevor and Nate all wanted their kick made faster and I made the same adjustment to their skis. Not the wax. Mitch did a morning run; Trevor did not. Not the morning run. I had massaged Trevor, Nate and Anna. Maybe? The pattern could also be the literal pattern of the ski. When a ski is manufactured it is given a pattern on the base, called a grind. There a grinds for cold, dry snow and grinds for warm, wet snow. Sometimes in addition to the existing pattern on a ski, we also overlay another set of reels. We use a tool, called a structure tool. Today, Isaiah selected a particular pattern that he expertly pressed into each ski. This was the final ski manipulation in a series. The skis are first base waxed with a paraffin, then topped with a full fluorocarbon powder. Only moments before Isaiah pressed the structure pattern into the skies, Christi and I had ironed on the full fluorocarbon. The pattern of my breath through the respirator seemed to mirror the pull of the iron across the ski. To say that full fluorocarbon ‘melts’ would fail to represent the chemistry. It simply seems to morph from powder to an oily film that adheres to the ski base enough so that when excess is brushed away, the film repels water more expertly than any other known chemical. 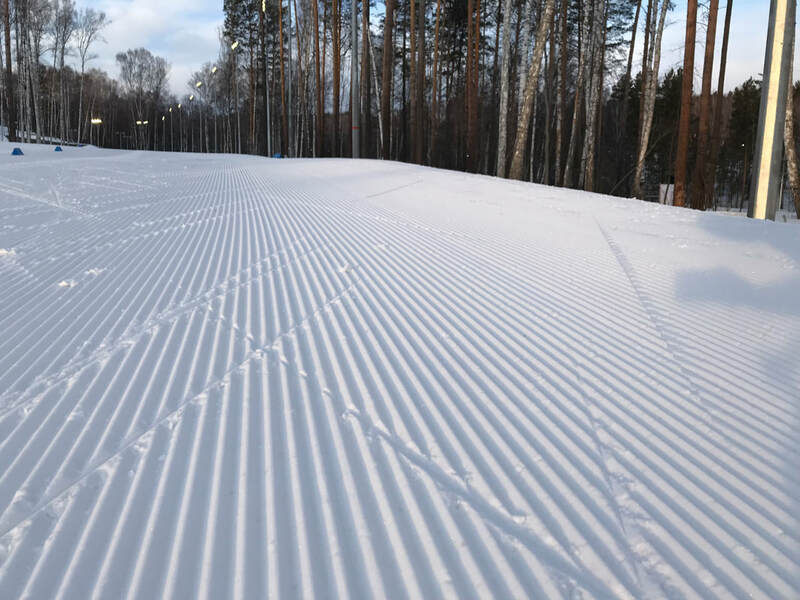 This allows skis to glide across the pattern on the snow (called corduroy) without experiencing any suction. Perhaps instead, the pattern is the varying learner development spirals. As compared to most races at home, the World University Games is filled with new images, objects and experiences that, for some learners, extend beyond the patterns with which they are familiar, beyond the comfort of their existing empirical abstractions. Every day we ride a bus from the athlete village to the venue. It is a 12-minute bus ride if everything goes smoothly. In order to get onto the bus, we must show our credential. Once on the bus, a security guard seals the bus door. It is a literal seal of colored tape. If this seal is broken at any point during the drive than security is considered breeched. Once we arrive at the venue, before we can enter the gated compound, the bus is searched on all of its external crevices. A special camera is used to view the underside, to peer into any hiding place. Once we pass security and enter the building where the wax cabinets and changing rooms are located, we must again wear our credential. Inside our changing room, we store our bibs. The athletes wear bibs labeled ‘athlete’ and the coaches wear bibs labeled ‘team’. These bibs are required in order to be on the course. For many athletes, this style of venue seems a world away from the quiet, snowy trails of Wyoming, Minnesota, Colorado, Vermont, Alaska… Does the pattern lie in the struggle to perform familiar actions in such an unfamiliar environment? Mitch and Kevin came to the 2017 World University Games in Kazakhstan. Trevor, Ana, Anna, Nate and Rya did not. Perhaps then, the answer is ‘no’. Half-way through the race on the first day, as I walked back to the wax cabinet in the brief quiet period between the women’s and men’s races, I looked up and, as I tried to cross the street, was nearly hit by a cavalcade of white and black Mercedes Sprinters, SUVs and a limousine. I thought this to be out of the ordinary but not so much as to cause my focus to waiver. It wasn’t until half-way through the men’s race that I realized that the limousine had carried President Putin. He had come to watch the men’s race. In the quiet after both races were complete I sat on the windowsill outside of our wax cabinet. I stared at the cavalcade of black and white vehicles. I felt that this pattern should cause dissonance at the venue of a sport that, in the United States, many do not even understand. Yet somehow, it did not. My eyes fell to the black and white letters on my Madshus boots; they were a perfect reflection of the vehicle pattern. My fingers now trace a figure 8 in which the crossing point is centered at the spine and each lobe encompasses a scapula. This pattern is familiar, comfortable and does not put me outside of my cognitive comfort zone. In fact, in this place of mindfulness, I feel much more than I think. Perhaps this is the pattern. When I massage, I exist as a complete body-mind; I allow my body to meld with my mind and to take the lead. In a ski race, once the gun goes off, the body remembers more than the mind. Even when the mind feels unease, those athletes who can allow their body-minds to become one find familiarity, and a ski race under high security being viewed by the Russian President feels little different than a ski race in the cold, quiet woods of Wyoming. ​She wore a red coat and had long dark hair. She was crouched on the tile stairs in front of our dorm-style lodging. A parade of athletes walked by and most did not look down. She scrubbed tirelessly until the ceramic tiles shone. She worked on each tile, meticulously, dipping a rag into the bucket, scrubbing, dipping, scrubbing. Thousands, maybe millions of hours are invested in an event like the World University Games. The athlete village alone is filled with hundreds of volunteers, each one making a tiny cog in the machine. No detail is left undone. At each security check point, there are at least eight officers and even more attachés. The attachés are students, each one fluent in at least one other language. They are paired with teams to assist them in every aspect of their daily routine. They help us find ski shops where we can purchase wax remover (something we cannot fly with). They translate simple questions like, “where is the bus stop.” They work in the fitness room and help make reservations for trips into the city. Invisible. She scrubbed each tile. I wondered whether the water in the bucket was warm. Today, at the Nordic ski venue I heard an attaché tell the Chinese athletes that she had taken six years of Chinese and still felt far from proficient. She told her story as she guided the athletes to their wax cabinet and changing room. At home, in Colorado and Wyoming, we generally wax outdoors, sometimes in blinding snow storms. Here, at the World University Games, we have two large indoor wax rooms. Each one has two wax benches and shiny tile floors. As we unpacked, I tried to figure the value of the equipment and wax that now consumed the space, $60,000? Maybe closer to $100,000. Her coat looked thin. I wondered how many times each day she had to scrub. The athlete village is filled with ice sculptures. Each is intricately carved and at night the lights behind them sparkle making it easy to see the minute cracks. They form tiny mountain tops and trees. Last night I walked with our athlete, Emma, and we thought together about the years of planning that made all of this possible. She said, “I believe they started planning in 2012”. Each year at the end of the Games, athletes from all countries come together for the closing ceremonies. They trade their coats, hats, race suits. Though I know that it is the very act of benevolence that really never changes a system, I think I will just leave my coat for the girl who scrubs the stairs. The towels in our room are embroidered with Krasnoyarsk 2019, 29th Winter Universiade. The pillows have the same insignia, as do the comforters. Each lodger receives a gift bag that also bears the Universiade name and in each bag is a toothbrush, toothpaste, shampoo and conditioner. We dine in an amphitheater where there is a 1200ft spread of food; each is labeled: Halal, Asian, European and Russian. The dining hall is open from 5am to 1am every day. Six to seven student servers fill our dishes at every station. Lines of coolers are filled with bottled water, Fanta and Coke. These coolers are also in every dorm and on each floor of the venue. Today, I walked down a quiet hall where a volunteer monitored one of the water coolers. She sat there so quietly that at first I did not see her. I knew I didn’t need to ask to get a water bottle but I did because I hoped it would make her feel seen. Last year in Kazakhstan, there was a volunteer who sat next to the front door of our dorms. Throughout the two-week games, he never went home. He fell asleep in his chair sometimes. The opening ceremonies are tomorrow night. The athlete parade will precede a show that took two years to prepare. It will showcase the history of Siberia and features Olympic figure skating champions. The event will be televised around the world, including by our own NBC Olympic channel. It seems likely that there will be millions of viewers. Hey all, Bryan here again. I wanted to share this TED talk on statistics and the "developing world". I feel it is interesting to think about in regards to implicit bias and othering. In any case, if you have time to watch I hope you enjoy it! Link here or below. Hey all, Bryan here. I just wanted to throw out an excerpt from a book I am reading, as I believe it relates relatively well to the power perspective can play in our lives. The only problem is that I feel the need to include a good bit of background information such that some of the assumptions going into the statements are better understood and related (aka the excerpt is kind of long). The book is titled, "Behave: The Biology of Humans at Our Best and Worst", and this is from the introduction in a section called, "The Approach in This Book". The truly relevant information can be found near to and in the last paragraph, if you can’t be bothered to read the whole thing. Anyways, I hope it can help inform and reinforce many of the discussions we have had thus far. "I make my living as a combination neurobiologist-someone who studies the brain-and primatologist-someone who studies monkeys and apes. Therefore, this is a book that is rooted in science, specifically biology. And out of that come three key points. First, you can't begin to understand things like aggression, competition, cooperation, and empathy without biology; I say this for the benefit of a certain breed of social scientist who finds biology to be irrelevant and a bit ideologically suspect when thinking about human social behavior. But just as important, second, you're just as much up the creek if you rely only on biology; this is said for the benefit of a style of molecular fundamentalist who believes that the social sciences are destined to be consumed by "real" science. And as a third point, by the time you finish this book, you'll see that it actually makes no sense to distinguish between aspects of a behavior that are "biological" and those that would be described as, say, "psychological" or "cultural." Utterly intertwined. Understanding the biology of these human behaviors is obviously important. But unfortunately it is hellishly complicated. Now, if you were interested in the biology of, say, how migrating birds navigate, or in the mating reflex that occurs in female hamsters when they're ovulating, this would be an easier task. But that's not what we're interested in. Instead, it's human behavior, human social behavior, and in many cases abnormal human social behavior. And it is indeed a mess, a subject involving brain chemistry, hormones, sensory cues, prenatal environment, early experience, genes, both biological and cultural evolution, and ecological pressures, among other things. How are we supposed to make sense of all these factors in thinking about behavior? We tend to use a certain cognitive strategy when dealing with complex, multifaceted phenomena, in that we break down those separate facets into categories, into buckets of explanation. Suppose there's a rooster standing next to you, and there's a chicken across the street. The rooster gives a sexually solicitive gesture that is hot by chicken standards, and she promptly runs over to mate with him (I haven't a clue if this is how it works, but let's just suppose). And thus we have a key behavioral biological question-why did the chicken cross the road? And if you're a psychoneuroendocrinologist, your answer would be "Because circulating estrogen levels in that chicken worked in a certain part of her brain to make her responsive to this male signaling," and if you're a bioengineer, the answer would be "Because the long bone in the leg of the chicken forms a fulcrum for her pelvis (or some such thing), allowing her to move forward rapidly," and if you're an evolutionary biologist, you'd say, "Because over the course of millions of years, chickens that responded to such gestures at a time that they were fertile left more copies of their genes, and thus this is now an innate behavior in chickens," and son, thinking in categories, in differing scientific disciplines of explanation. The goal of this book is to avoid such categorical thinking. Putting facts into nice cleanly demarcated buckets of explanation has its advantages-for example, it can help you remember facts better. But it can wreak havoc on your ability to think about those facts. This is because the boundaries between different categories are often arbitrary, but once some arbitrary boundary exists, we forget that it is arbitrary and get way too impressed with its importance. For example, the visual spectrum is a continuum of wavelengths from violet to red, and it is arbitrary where boundaries are put for different color names (for example, where we see a transition from “blue” to “green”); as proof of this, different languages arbitrarily split up the visual spectrum at different points in coming up with the words for different colors. Show someone two roughly similar colors. If the color-name boundary in that person’s language happens to fall between the two colors, the person will overestimate the difference between the two. If the colors fall in the same category, the opposite happens. In other words, when you think categorically, you have trouble seeing how similar or different two things are. If you pay lots of attention to where boundaries are, you pay less attention to complete pictures. Thus, the official intellectual goal of this book is to avoid using categorical buckets when thinking about the biology of some of our most complicated behaviors, even more complicated than chickens crossing roads. A behavior has just occurred. Why did it happen? Your first category of explanation is going to be a neurobiological one. What went on in that person’s brain a second before the behavior happened? Now pull out to a slightly larger field of vision, your next category of explanation, a little earlier in time. What sight, sound, or smell in the previous seconds to minutes triggered the nervous system to produce that behavior? On to the next explanatory category. What hormones acted hours to days earlier to change how responsive that individual was to the sensory stimuli that trigger the nervous system to produce the behavior? And by now you’ve increased your field of vision to be thinking about neurobiology and the sensory world of our environment and short-term endocrinology in trying to explain what happened. And you just keep expanding. What features of the environment in the prior weeks to years changed the structure and function of that person’s brain and thus changed how it responded to those hormones and environmental stimuli? Then you go further back to the childhood of the individual, their fetal environment, then their genetic makeup. And then you increase the view to encompass factors larger than that one individual-how has culture shaped the behavior of people living in that individual’s group? –what ecological factors helped shape that culture-expanding and expanding until considering events umpteen millennia ago and the evolution of that behavior. Okay, so this represents an improvement-it seems like instead of trying to explain all of behavior with a single discipline (e.g., “Everything can be explained with knowledge about this particular [take your pick:] hormone/gene/childhood event”), we’ll be thinking about a bunch of disciplinary buckets. But something subtler will be done, and this is the most important idea in the book: when you explain a behavior with one of these disciplines, you are implicitly invoking all the disciplines-any given type of explanation is the end product of the influences that preceded it. It has to work this way. If you say, “The behavior occurred because of the release of neurochemical Y in the brain,” you are also saying, “the behavior occurred because the heavy secretion of hormone X this morning increased the levels of neurochemical Y.” You’re also saying, “The behavior occurred because the environment in which that person was raised made her brain more likely to release neurochemical Y in response to certain types of stimuli.” And you’re also saying, “…because of the gene that codes for the particular version of neurochemical Y.” And if you’ve so much as whispered the word “gene,” you’re also saying, “…and because of the millennia of factors that shaped the evolution of that particular gene.” And so on. There are not different disciplinary buckets. Instead, each one is the end product of all the biological influences that came before it and will influence all the factors that follow it. Thus, it is impossible to conclude that a behavior is caused by a gene, a hormone, a childhood trauma, because the second you invoke one type of explanation, you are de facto invoking them all. No buckets. A “neurobiological” or “genetic” or “developmental” explanation for a behavior is just shorthand, an expository convenience for temporarily approaching the whole multifactorial arc from a particular perspective. Obviously, scientists aren’t like that. They’re smart. They understand that they need to take lots of angles into account. Of necessity, their research may focus on a narrow subject, because there are limits to how much on person can obsess over. But of course they know that their particular categorical bucket isn’t the whole story. Give me a dozen healthy infants, well formed, and my own specified world to bring them up in and I’ll guarantee to take any one at random and train him to become any type of specialist I might select – doctor, lawyer, artist, merchant-chief and yes, even beggar-man thief, regardless of his talents, penchants, tendencies, abilities, vocations, and race of his ancestors. This was John Watson, a founder of behaviorism, writing around 1925. Behaviorism, with its notion that behavior is completely malleable, that it can be shaped into anything in the right environment, dominated American psychology in the midtwentieth century; we’ll return to behaviorism, and its considerable limitations. The point is that Watson was pathologically caught inside a bucket having to do with the environmental influences on development. “I’ll guarantee…to train him to become any type.” Yet we are not all born the same, with the same potential, regardless of how we are trained. Normal psychic life depends upon the good functioning of brain synapses, and mental disorders appear as a result of synaptic derangements…It is necessary to alter these synaptic adjustments and change the paths chosen by the impulses in their constant passage so as to modify the corresponding ideas and force thought into different channels. Alter synaptic adjustments. Sounds delicate. Yeah, right. These were the words of the Portuguese neurologist Egas Moniz, around the time he was awarded the Nobel Prize in 1949 for his development of frontal leukotomies. Here was an individual pathologically stuck in a bucket having to do with a crude version of the nervous system. Just tweak those microscopic synapses with a big ol’ ice pick (as was done once leukotomies, later renamed frontal lobotomies, became an assembly line operation). The immensely high reproduction rate in the moral imbecile has long been established…Socially inferior human material is enabled…to penetrate and finally to annihilate the healthy nation. The selection for toughness, heroism, social utility…must be accomplished by some human institution if mankind, in default of selective factors, is not to be ruined by domestication-induced degeneracy. The racial idea as the basis of our state has already accomplished much in this respect. We must-and should-rely on the healthy feelings of our Best and charge them...with the extermination of elements of the population loaded with dregs. This was Konrad Lorenz, animal behaviorist, Nobel laureate, cofounder of the field of ethology (stay tuned), regular on nature TV programs. Grandfatherly Konrad, in his Austrian shorts and suspenders, being followed by his imprinted baby geese, was also a rabid Nazi propagandist. Lorenz joined the Nazi Party the instant Austrians were eligible, and joined the party’s Office of Race Policy, working to psychologically screen Poles of mixed Polish/German parentage, helping to determine which were sufficiently Germanized to be spared death. Here was a man pathologically mired in an imaginary bucket related to gross misinterpretations of what genes do. This blog is a compilation of thoughts, essays, class projects, etc. from SNOW Athletes.